6.5 Japanese (JAP) Ammo is more formally known as 6.5 x 50 Japanese Arisaka. It’s a vintage, military, rimmed, bottle necked, .26 caliber, rifle cartridge that was originally introduced in 1897 as a mate for a model of bolt action rifle that was quickly discontinued due to inherent design flaws that caused the rifle to be unsafe. However, this cartridge was given a second chance when it was adopted by the Japanese military in 1905 for use in the Model 38 bolt action rifle and was introduced to the American shooting public after WWII by G.I.’s returning with captured rifles and later by military surplus dealers. Consequently, both military and 6.5 Jap sporting ammunition is still available but, it should be noted that the military version of this cartridge features Berdan primers whereas, modern factory loads feature Boxer primers. In addition, although this cartridge has the shortest case and the least powder capacity of any 6.5 mm military cartridge, the Model 38 rifle features an exceptionally strong action which enables the military round to be loaded to maximum pressures. 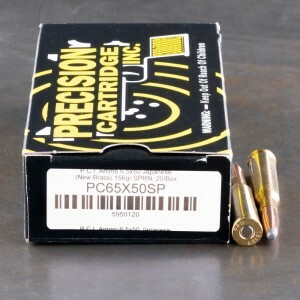 With bullet weights generally ranging from 120 grain to 156 grain and muzzle velocities generally ranging from 2,400 feet per second to 2,600 feet per second, this cartridge generates enough muzzle energy to provide adequate penetration to take down small to medium size game species such as Coyotes, White Tail Deer, Antelope, Sheep, and Black Bear. Plus, with a level of experienced recoil similar to that of the venerable .30-30, 6.5x50 Japanese ammo makes an excellent deer cartridge for young hunters and, when loaded with light weight bullets, it also serves as a fun cartridge for plinking. Fired a box through my Type 38 Arisaka. Worked flawlessly. Very accurate at 200 yards with old iron sights.